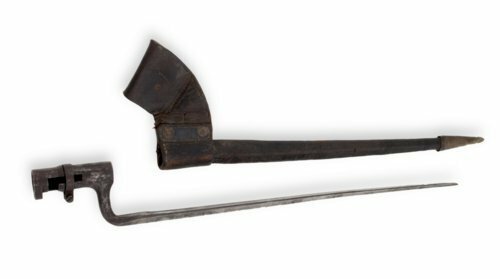 Alfred Larzelere used this steel bayonet for a U.S. rifle-musket model 1855-1870 during the Civil War. The bayonet has a 25/32" bore socket and L pattern mortise. Larzelere's military service commenced with the 10th Kansas Infantry where he served as Regimental Quartermaster. In 1862 he transferred to the 3rd Indian Home Guards, where he was 1st Lieutenant and Regimental Quartermaster. Three American Indian regiments were actively engaged in federal service during the war, fighting mostly in Indian Territory and Arkansas; they were almost entirely recruited in Kansas from the refugee Seminole and Creek tribes. White men served as the officers for these regiments.